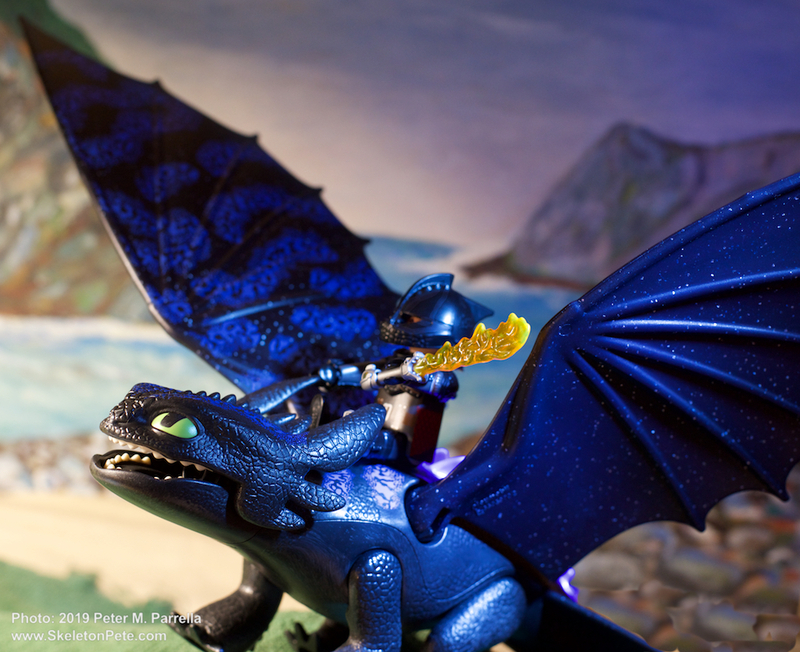 Playmobil action figures of Dragons heroes Toothless and Hiccup soar into battle. 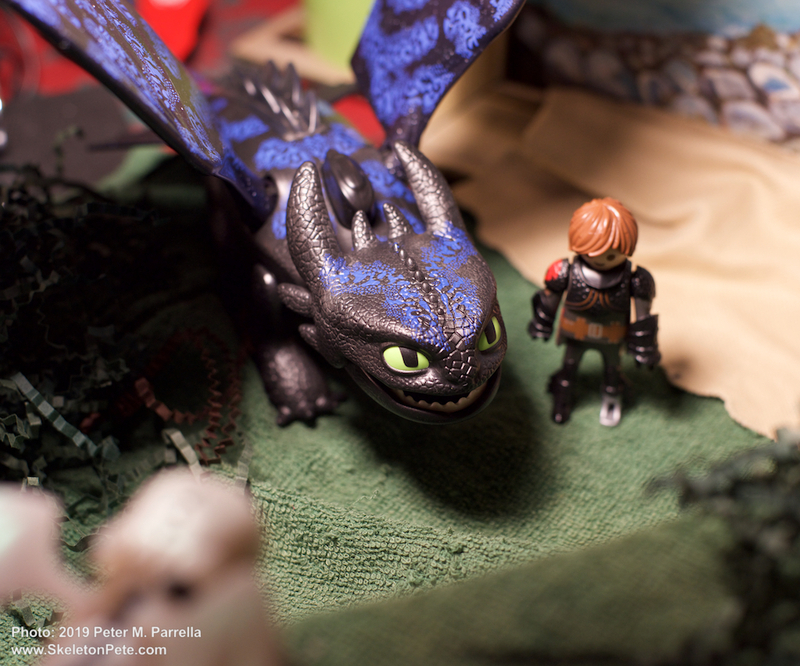 With the imminent release of Dreamworks’ Dragons: The Hidden World on February 22 the well loved How To Train Your Dragon series is headed for an epic finale. Previewers have already given it a nearly perfect Rotten Tomatoes score, quite a feat for the third installment of a nearly decade old franchise. 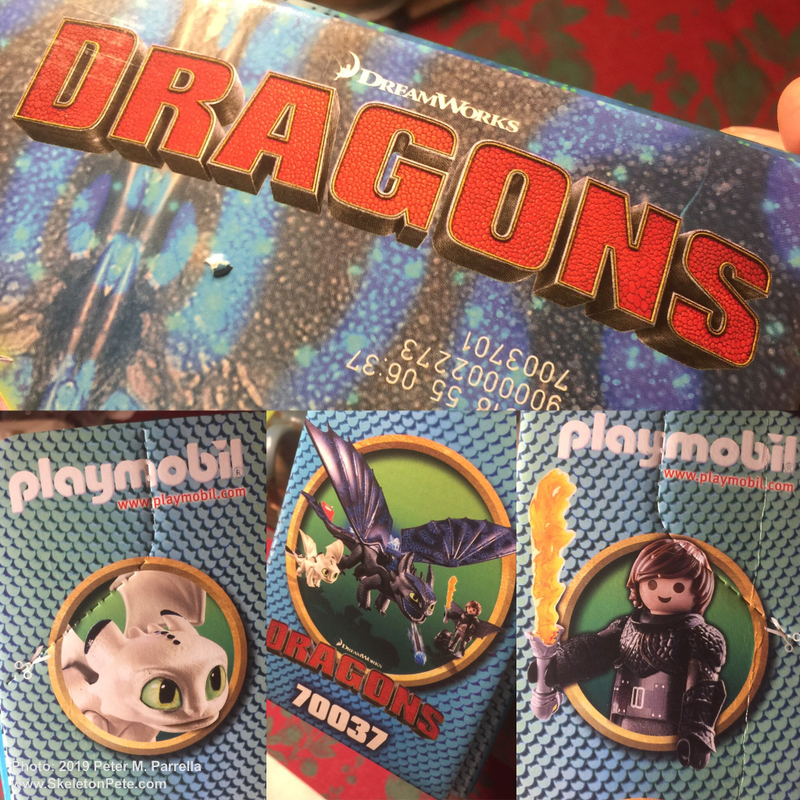 To add to the imaginative experience for youngsters Playmobil has announced several additions to their line of licensed Dragons figures. 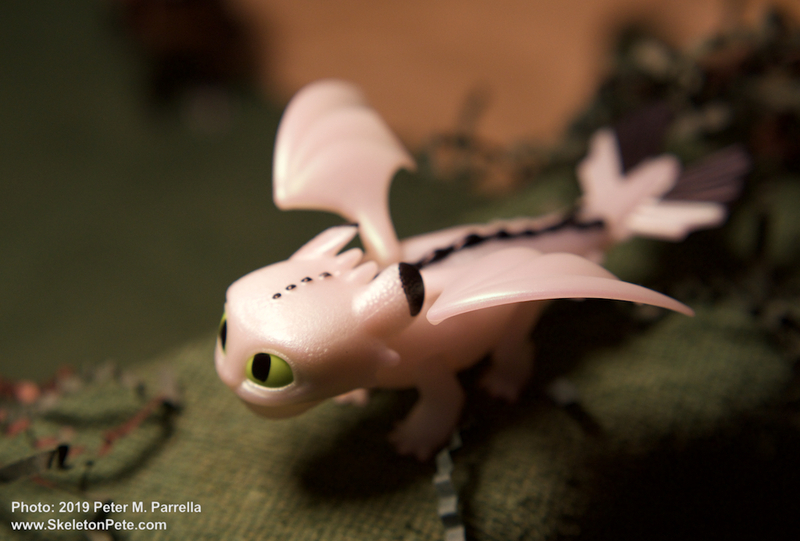 The new packages feature characters and accessories unique to the third part’s narrative. 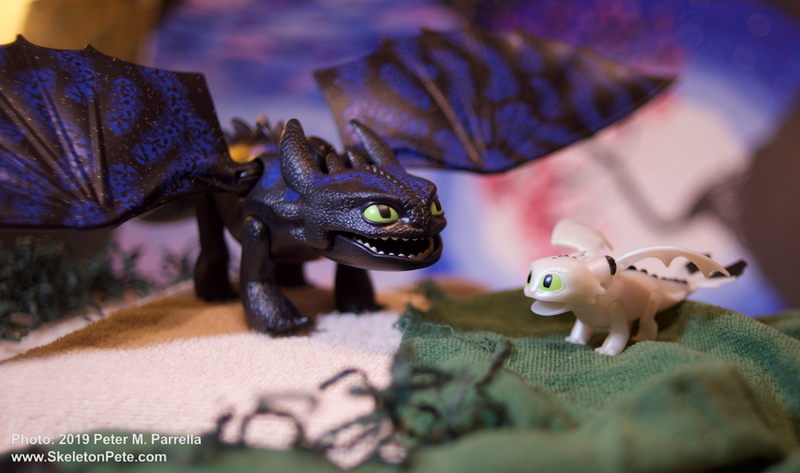 That includes the “light fury,” a love interest for lead dragon Toothless. 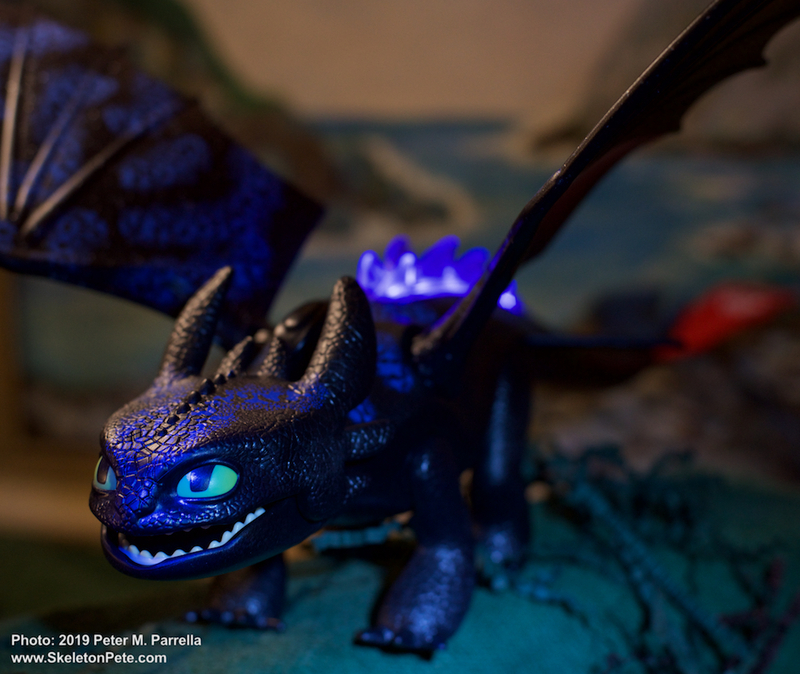 Yep, you’ve seen the trailers and TV spots so it’s no spoiler to note that our favorite dragon is smitten with his newly discovered female counterpart. She’s coy and she’s tuff and a guide to dragonkind’s hidden homeland. 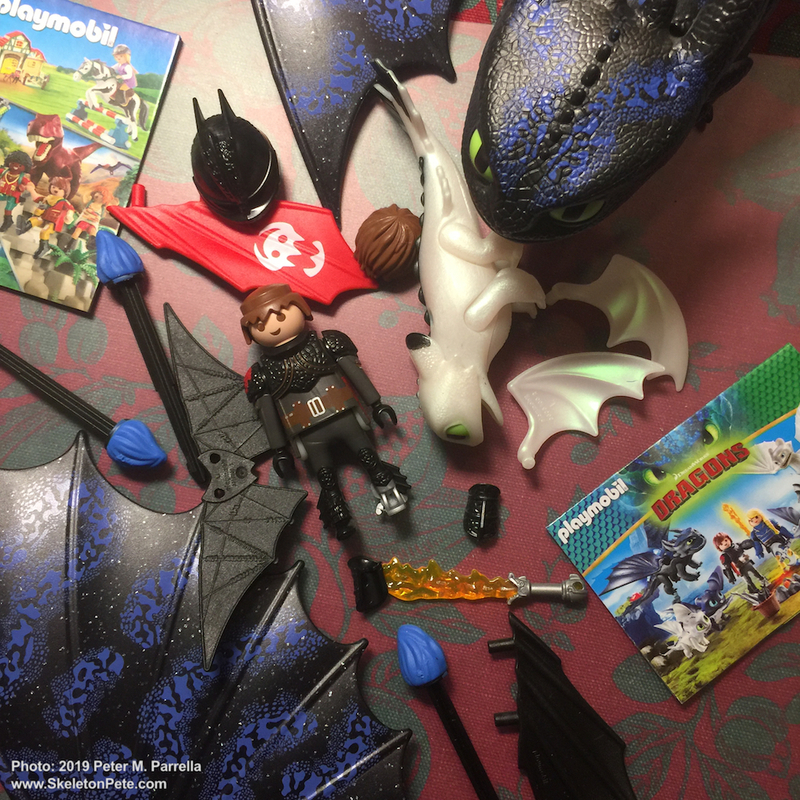 There are new multi-piece Playmobil playsets presenting Toothless and Hiccup, the villainous Grimmel and his dragon Deathgripper, Light Fury and Berk Village children, as well as flight suit versions of Astrid, Ruffnut and Tuffnut, Snoutlout and Fishlegs. 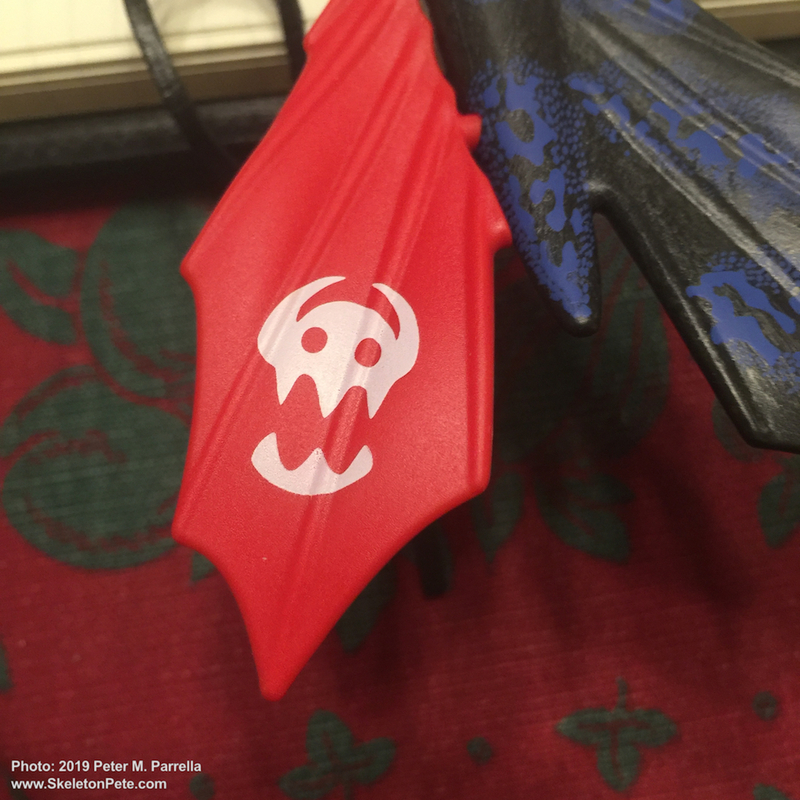 Each has plenty of accessories. 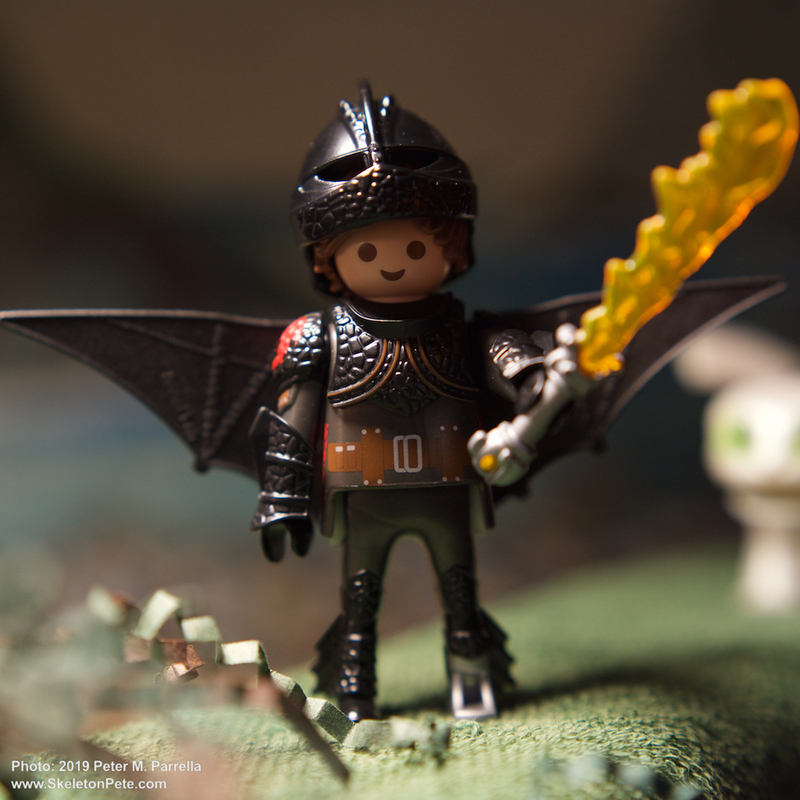 Please follow to the link to Playmobil site to see all the packages, as well as their other toys. 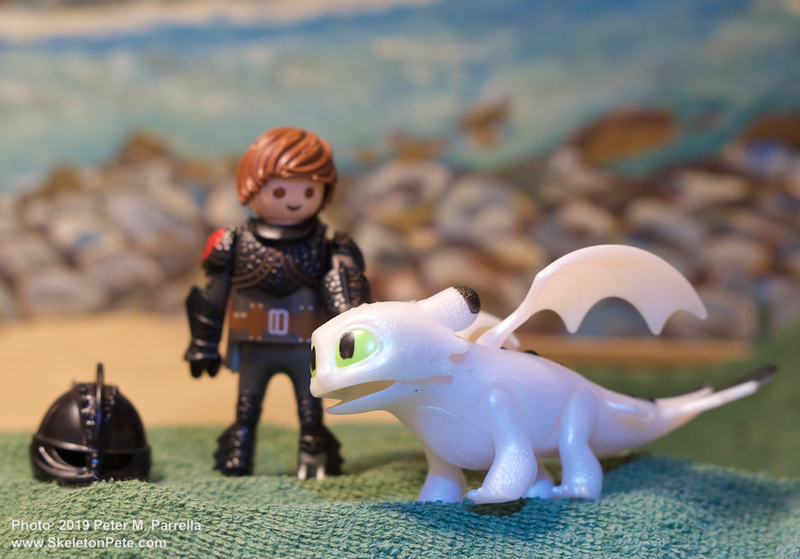 Leading up to the film’s release date, I had the opportunity to point a camera at Playmobil Dragons set 70037, which includes Toothless, Hiccup and a baby white dragon; 19 pieces total. 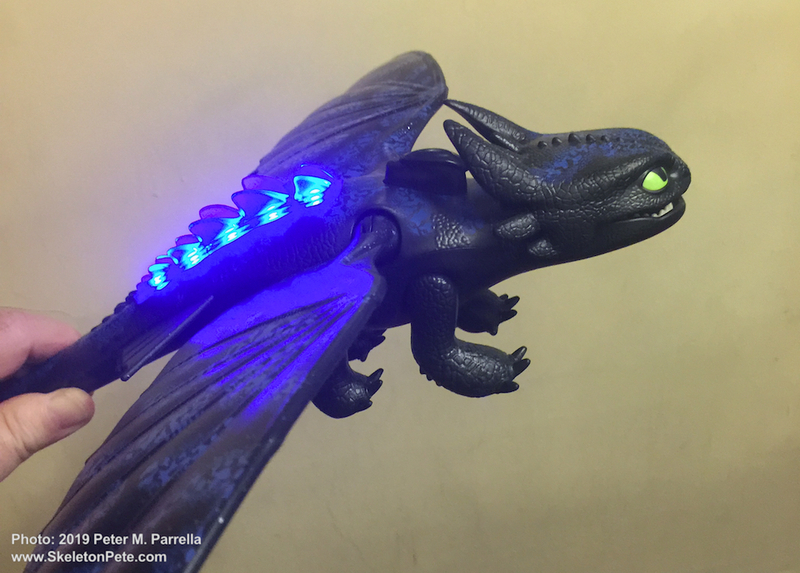 Toothless has an impressive 20 inch wing span that is painted to represent his fire charged power in The Hidden World. 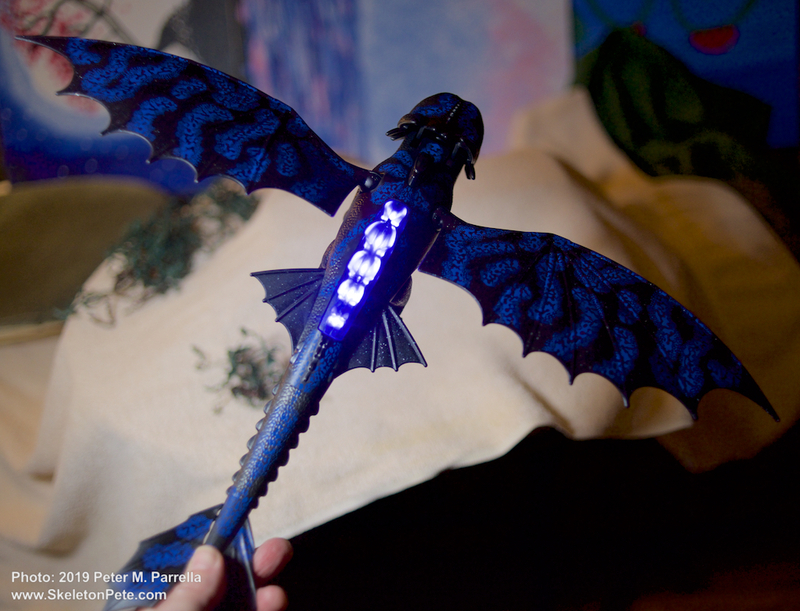 He is tricked out with illuminated spikes and can shoot blue tipped arrows from his mouth. 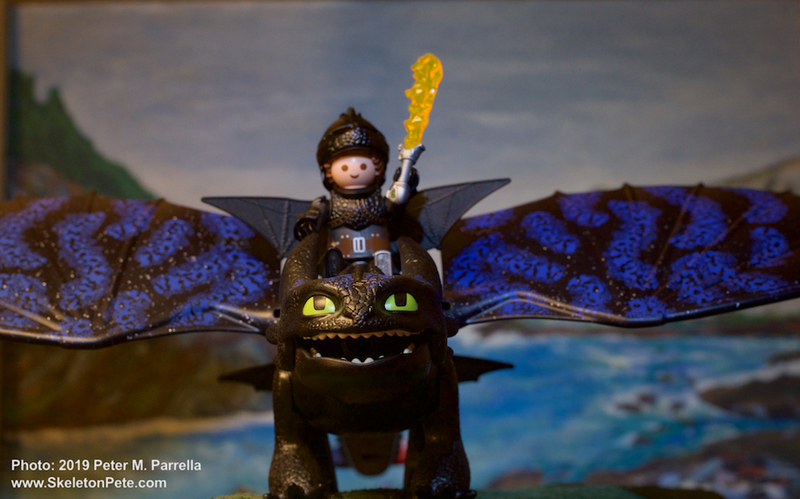 He has a back mount so that Hiccup can ride him into battle. 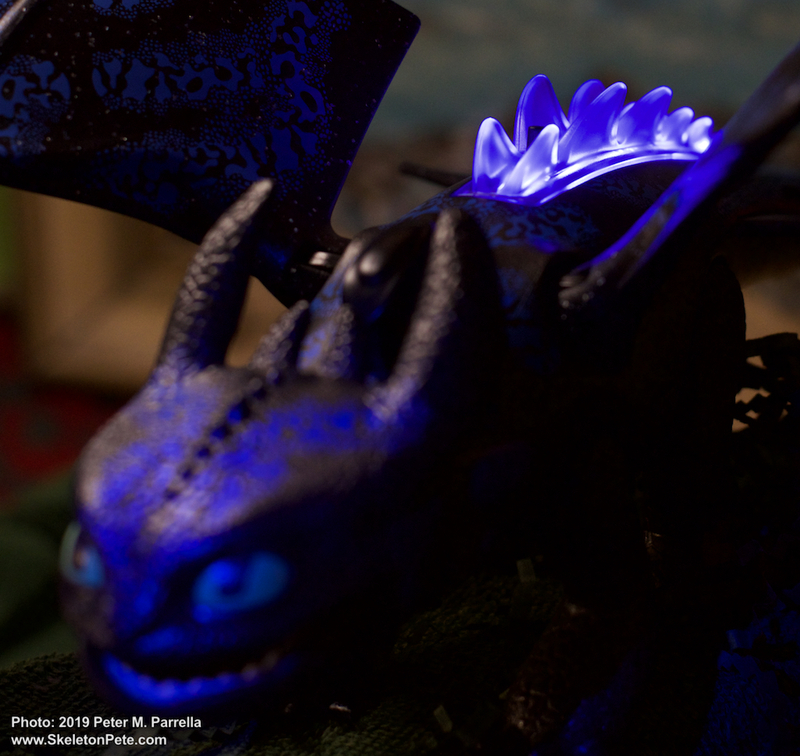 Flame arrows are launched from Toothless’s mouth by tipping back his horns. Aimed at my living room couch, I tested their range to be about 5-6 feet, with an accuracy good enough to make knocking down foe figures fun. 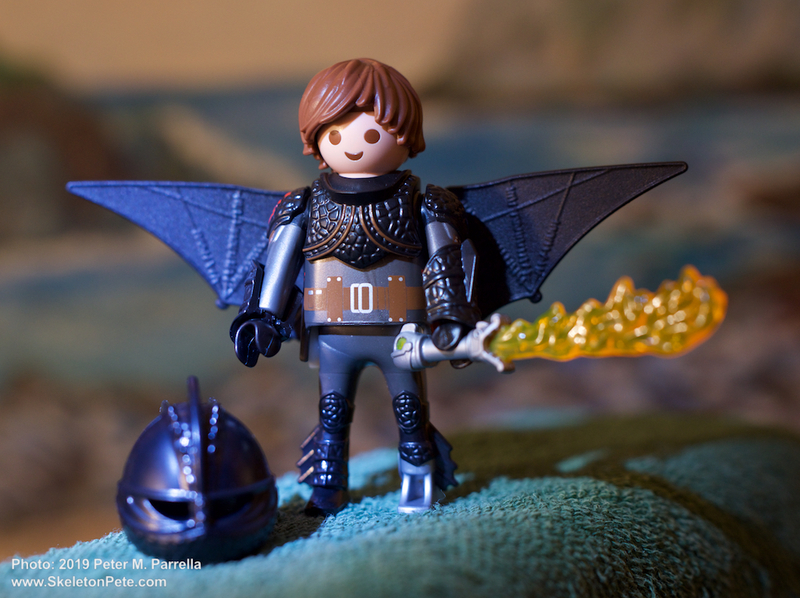 The young Viking hero Hiccup comes with glider wings, a helmet and flaming sword to brandish against Grimmel. 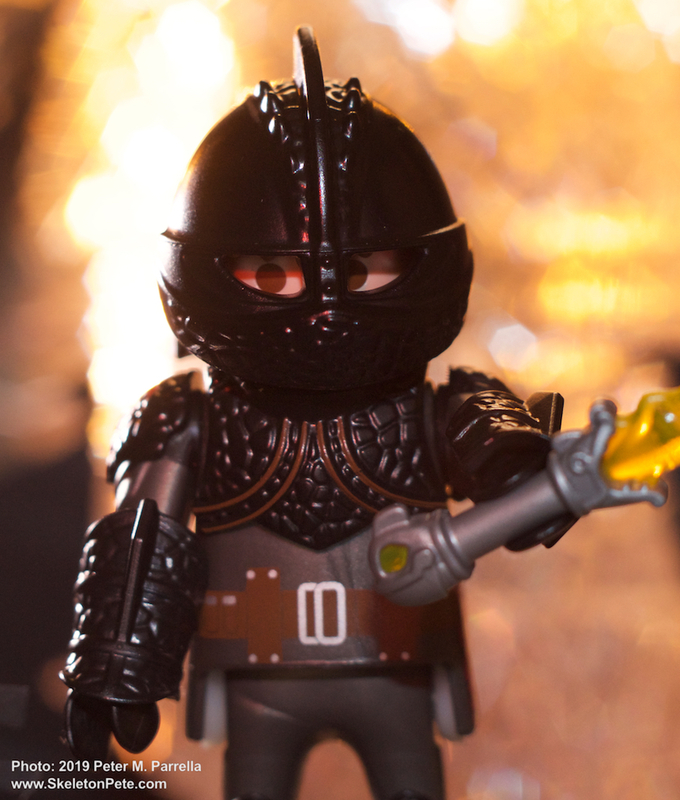 I love photographing miniatures so I especially appreciate the fine details and texture of his armor right down to the gauntlet cuffs. 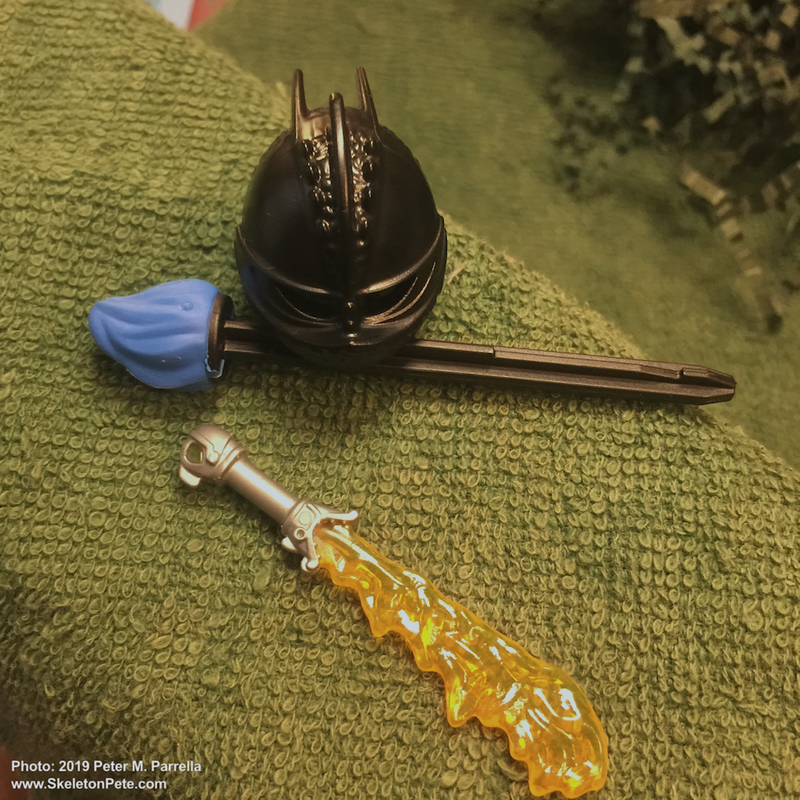 The sword’s rendering of flame in translucent plastic is a very nice touch. 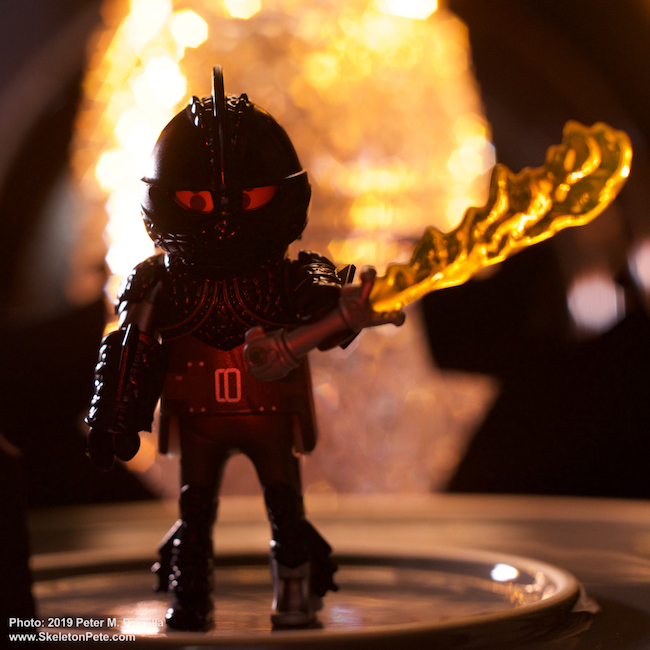 Playmobil Hiccup with flame sword in the heat of battle. 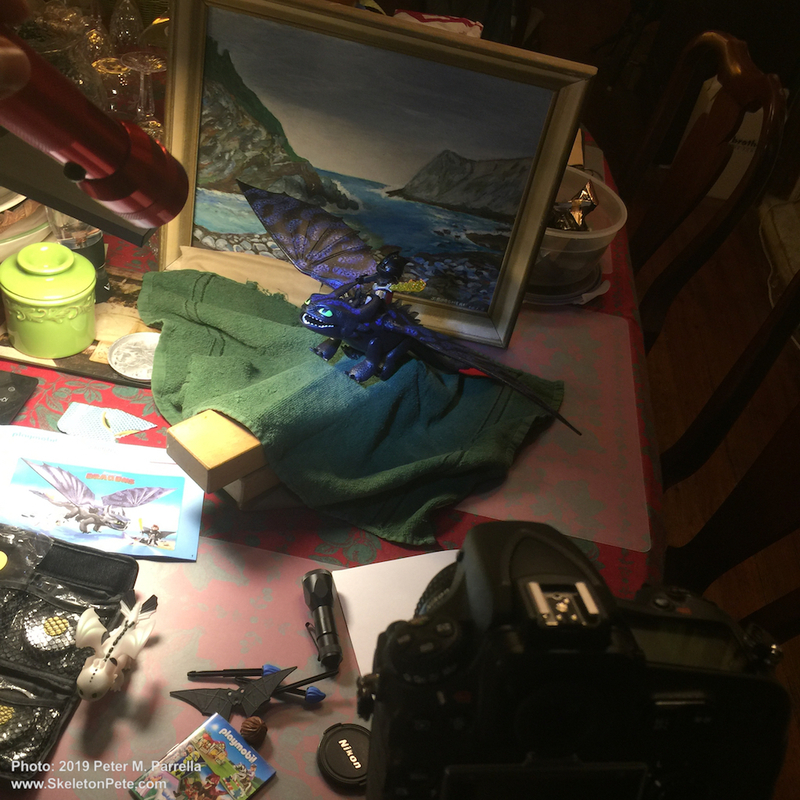 As usual my studio for toy photography was the dining room table. 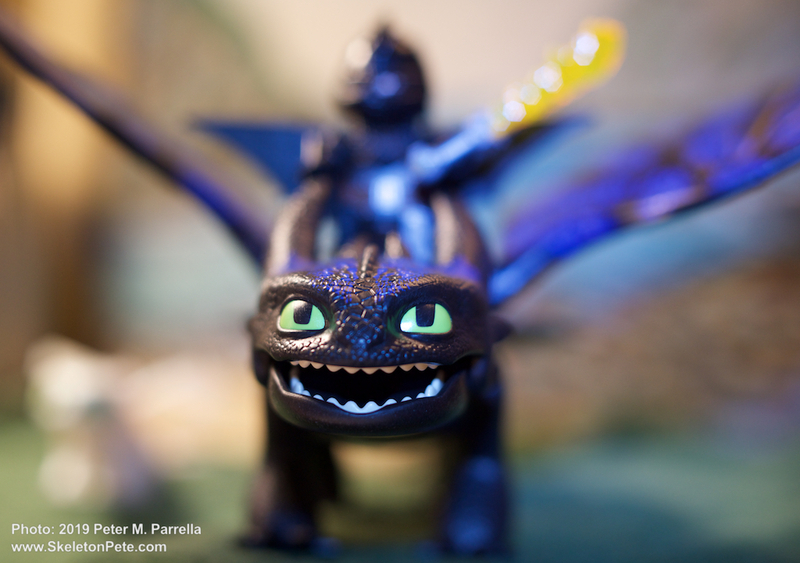 When capturing images of miniatures limited depth of field is your friend and serves to trick the eye. The oddest items stand in for their real life similes. Anything and everything from bathroom towels to my wife’s Waterford crystal gets pressed into service as props and gobos for scenic and lighting effects. The backdrop for some of the pictures is a painting done by my grandfather Joe in 1968. It depicts his memory of the rocky island off the coast of Italy where he lived until age seven. A typical toy photography set-up at my house. 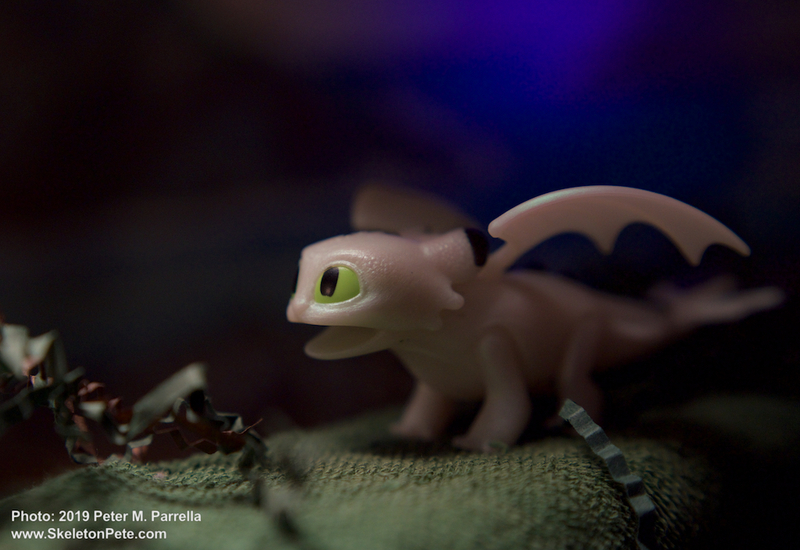 Resulting images are in the gallery. 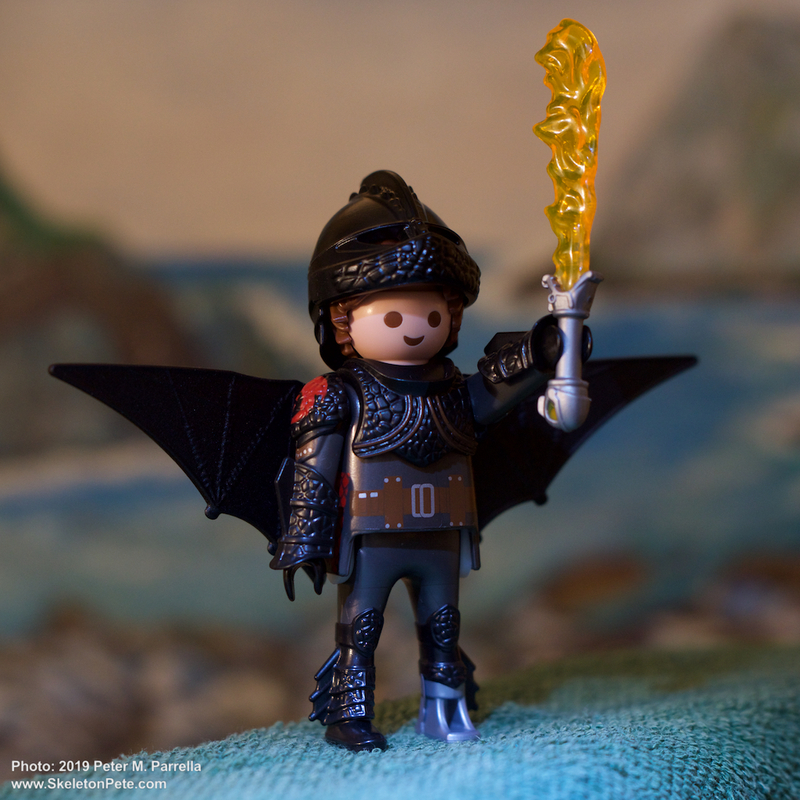 Andy and I will be meeting with Playmobil representatives at The Toy Association‘s New York International Toy Fair this week, and we’ll be reporting on the many other goodies they have in store for you and your kids.